Industry suppliers with deep rooted horticultural histories will once again host a unique educational summit, supported by MJBizCon prior to their 7th annual show for cannabis professionals in Las Vegas. 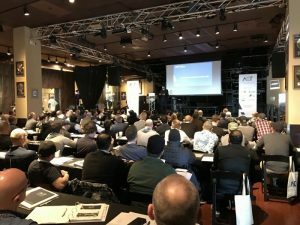 On Tuesday, November 13th, the Advancing Cannabis Cultivation Technology Summit (ACT) will bring together cannabis cultivators, owners, and investors for a full day of education on the latest cutting-edge technologies and best practices designed to improve operational efficiency and increase overall profitability in today’s competitive cannabis cultivation landscape. The objective of ACT is simple: help you make your facility and operation as effective and efficient as possible. Commercial greenhouses have developed successful high-tech methods that optimize operations and yields. The summit’s corporate sponsors Gavita, Grodan, Meteor Systems, Priva, Svensson and Thermo Energy have worked with large commercial growers for decades to implement the proven technologies needed to run high-tech cultivation facilities. The one day event features a compelling mix of six industry experts and will spotlight the essential role of advanced cultivation technologies, including keynote speaker Laust Dam of Aurora/ALPS and featured speakers Paul Selina from Village Farms/PureSun and Jody Vukas from Smart Grow Pros, adding valuable experienced-based insight. The ACT Summit will be held on Tuesday, November 13th, 2018 at the Hard Rock Café in Last Vegas and will feature presentations sharing years of commercial growing experience, a lively roundtable discussion featuring the day’s hot topics, and the unique opportunity to speak directly to the experts at a post-summit reception. Register today to secure your spot at the ACT summit in Las Vegas to learn the proven commercial scale growing methods that will help you stay competitive and keep your operating costs to a minimum while delivering greater plant yield and a higher quality product. Limited seats available. Full day access, including drinks, lunch and networking reception only $299 with $100 discount for MJBizCon show registrants.